What is Kale? Super Foods for your muscle building diet. Home MUSCLE MEALS & NUTRITION SUPERFOODS FOR YOUR MUSCLE BUILDING DIET: WHAT IS KALE? Bored of broccoli in your muscle building diet? Switch it for the new “king of greens,” Kale. Here is a brief run down on this trendy green. So what is Kale? In the same family as cabbage and brussel sprouts, kale is a vegetable with green or purple leaves that looks similar to lettuce leaves. Kale is being called the new “king of greens” and is a great alternative to broccoli or salad greens in your muscle building diet as this low calorie, high fibre vegetable is packed with nutrients, is super versatile and tastes delicious! Kale is nutrient rich to feed your muscles. One cup of chopped kale contains just 34 calories, zero fat and 5 grams of fibre which aids digestion, lowers blood sugar and curbs overeating. 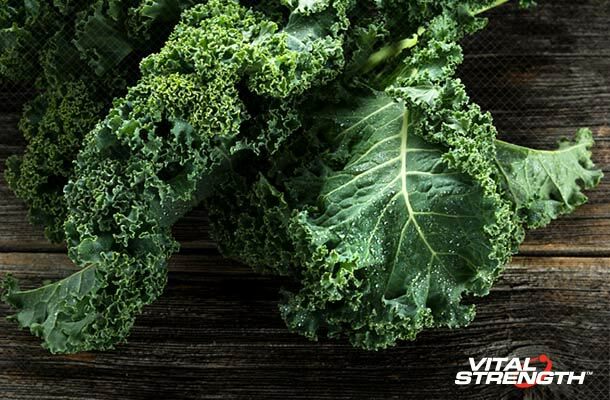 Kale is also packed with powerful antioxidants including vitamins A, C, and K and is high in iron which is essential for cell growth and other health benefits that can help you train harder in the gym. Per calorie kale has more iron than muscle building beef! While kale is available most of the year in Australia, kale peaks in the middle of winter through to the beginning of spring. Look for kale with firm stalks, deep-green small leaves and avoid any that are wilted or have yellow spots. Like other greens in your muscle building diet, store kale in the fridge loosely wrapped in plastic. Kale will usually last around 5 days in the fridge so this super green can easily be included in your weekly muscle meal food prep. Rinse kale leaves under cold water, cut the leaves into 1cm ribbons and stems into shorter lengths. Kale is great cooked or served raw in a salad. Mix up your greens and replace lettuce with nutrient rich kale in your favourite salad recipe. Simply rinse and chop the kale and combine with other vegies and salad dressing. Try this delicious green kale smoothie recipe that makes the perfect nutrient packed breakfast smoothie or post workout meal to help your muscles recover faster. Combines kale leaves with fruit, almond milk and Vitalstrength Whey Protein. Kale gives your smoothie extra texture, antioxidants and flavour. When you are on a muscle building diet kale chips make the perfect healthy alternative to regular calorie packed chips. Simply, preheat oven to 180 degrees. Line tray with baking paper. Wash and dry kale and cut the leaves into bite size pieces. Drizzle kale with a little olive oil and sprinkle with seasoning salt. Spread the kale out on tray and bake for 10 to 15 minutes until the edges brown but are not burnt. Cooked kale is a great alternative to steamed broccoli in your muscle building diet. Lightly steam kale for five minutes, saute kale in a pan with a little coconut oil or add to a soup or stir-fry. So if you are not a Kale convert yet, you are missing out on the numerous health benefits of this versatile green superfood. Add it to your healthy muscle building diet today!